One year a ago I was introduced to Trek Lite, a forum aimed at hikers, ultra lighters and those striving to shed some weight from their packs. Its a great forum and one filled with knowledge, experience and people with similar interests, I have personally found it a great place to learn new things, meet new people and generally work on my gear to make it lighter and more comfortable. In February this year (2018), I met up with a group from the forum for a winter walk on Dartmoor, my local stomping ground. It was great fun, on day one we had nothing but rain and mist and day two some sunshine and snow was thrown in to the mix. Move on a few months and I posted a new thread, seeing if anyone was interested in a summertime meet, again on Dartmoor. The interest level was good so I put a route together and a few weeks later we all met up at the Fox & Hounds pub, near Lydford for a few drinks, some food and then set off to make camp just before the rain started. The route that I planned was pretty much the route we walked, being a social meet up and with the high temperature we had been having in the UK the plan was for a 10 miles day one and 6-8mile day two. Dartmoor is somewhat unique in the the MOD are very active, live and blank firing on specific areas of the moor. Public access is limited when live firing is taking place, the times of live firing can be found HERE and anyone planning a trip on Dartmoor should check them out before setting off. The site is updated regularly and the three ranges, Okehampton, Willsworthy and Merrivale are clearly marked on OS Maps, mapping apps and most GPS devices that use OS Mapping. More information about the MOD’s use of the moor, including a basic range map can be found HERE. Shelters from left to right. 3fUL Lanshen 1, MLD Cuben Duomid, Tipik Pioulou, Tarptent StartoSpire 1, DD 3×3 Tarp, MLD Cricket, Tramplite, Yama Mountain Gear Swiftline and a Tarptent Notch. I took my Piolou from Tipik Tents, a number of the group had expressed an interest in seeing the shelter and I had only managed to use it for three nights previous. I had hoped for some overnight, rain and wind to give it a bit more of a test. As its the only one currently in the UK, a few people have asked for a review of the shelter, I will eventually get around to writing or filming one but not until I have tested it a bit more and its seen some varied weather. While a few of us were tucking in to our breakfasts at the pub, the final member of the group arrived and we had soon packed down and were heading off. The rain had started to come down and most of us had decided to put on out waterproofs, jackets, over trousers and kilts were on display but literally by the time we had reached the first Tor, everyone has stopped them off. We were all baking and the rain was turning to mist and not long after cleared up. The first part of day one saw up walk up to Arms Tor (SX542862), one of the more accessible tors on the moor and at 457 meters its one of the lower height tors on Dartmoor. A few photographs were taken before we set off to Great Links tor. Great Links, (SX550876), sits at 587 metres and has stunning 360 degree views, overlooking Lydford and looking towards Cornwall. The tor sits outside of the firing ranges and has an impressive rock formation with a trig point and a few places you could pitch up for the night dotted around. From Great Links, we made our down towards to old rain track/path and onwards to Kitty Tor. The path or track up to Kitty Tor is notoriously wet and boggy, thankfully though, the MoD have placed large scaffolding boards over some of the boggier bits to make things a little easier. The Tor itself is not overly impressive and the direct view is spoiled in a way by army observation huts but if you look beyond that the view is impressive. The West Okement valley is below and looking left to right is simply stunning. Leading down from Kitty Tor is a steep track that leads to the West Okement river and a popular crossing point called Sandy Ford. There are a few ‘Sandy Ford’s’ on Dartmoor, this one (SX574879) is often shallow enough to simply walk across the river but can be found to be fairly high after a storm. Just beyond the crossing there is a nice flat area that could easily accommodate upwards of ten shelters but is surrounded by bog to the north east and the river to the south. Leaving Sandy Ford our next Tor was Lints Tor. We stopped here for a spot of lunch and to top up our water supplies from the streams running just west of the Tor. After lunch and a coffee it was time to move on. We set off over Lints Tor and towards Kneeset Nose. Normally this is a marshy, boggy areas but it was fairly dry for us, with all the hot weather we’d had over the past weeks, allot of the bogs had all but dried out. After Kneeset Nose, we climbed to the top of Great Kneeset, at 567 meters this Tor offers more views down the West Okement valley. On top of Great Kneeset, our camp destination came in to view for the first time, Fur Tor dominating the far horizon. After having a quick drink and a chat, it was decided that we’d split into two groups, one would head for Fur Tor and there other to Cranmear Pool. The pool is not exactly a pool, although in winter months its a very very wet area and often very wet and boggy to reach. Its kind of a iconic spot being the first ‘Letter Box’ on Dartmoor. Inside the letterbox is a note book where visitors can write their name along with the date and a message, each year the book is replaced. Also inside is a plastic box with a rubber stamp and ink pad, letter boxing as its known is a popular hobby for many, collecting the stamps and a great way to explore the moor. The sunset was stunning and I think we all enjoyed it. For dinner I enjoyed a rather tasty Summit to Eat meal, these are in my opinion some of the best meals available today. I get mine from Basecamp Foods who stock a great selection of meals, stoves and other gear. Overnight the wind changed blowing directly in to my shelter, I’d left the doors open, simply using the bug inner. I didn’t mind this to be honest, the breeze was not overly strong and to it it was quite a warm night. The next morning, we packed up, left no trace and headed off towards another Sandy Ford, this one (SX572833) crossed the Amicombe Brook near where Fur Tor Brook joins and where they effectively flow into/become the River Tavy. Along the Northern banks of the river, there are numerous ancient stone huts sometimes referred to as the Water Oke settlement. I believe there are 16 huts in total, some of them have been restored and some left how they were found. After looking over a few of the old huts we carried on down, entering the Tavy Cleave which is arguable one of the prettiest areas on the moor. The cleave cuts it way through the hills with deep pools and waterfalls nearly its entire length. We carried along the cleave until we were just below Ger Tor, five of use decided to take a dip in one of the deeper pool areas and it was extremely refreshing. Everyone else looked on, had a bite to eat and a drink. 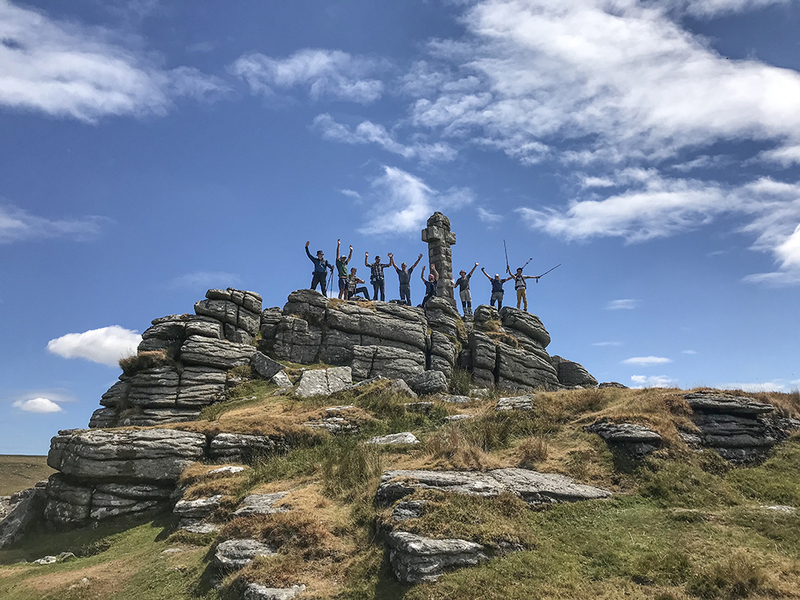 Once on top, more stunning views were absorbed before heading onward to Hare Tor, nearing the end of the walk we were all taking in the views, enjoying the weather and chatting away. It was here that one of the group was stung by a wasp. From Hare Tor we continued on staying just north of Doe Tor and crossing Doe Tor Brook where there is a ruin of an old wheel house. The area was once part of an open mine and the wheel was used to power the machinery. The wheel and most of the structures are long gone but the house ruin is fairly well intact and although quite rocky, the area in front has room for a pitch or two. Leaving the ruin, we continued on to our final tor, Brat Tor also referred to as Widgery Cross due to the large stone cross that sits on top. The tor is 452 meters high and can been seen for miles around, the cross makes it easily identifiable. We continued on to the River Lyd before heading back to the pub for a quick pint before heading home. It was great to catch up as well as meet some new people. These meets are often great for creating gear wish/shopping lists too and I think a few of us went away with ideas. A big thanks to everyone for making it a great weekend.